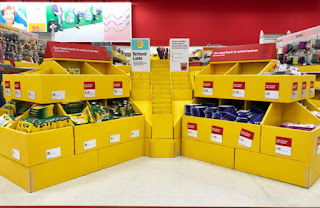 The Target Saver: Target: Extra 15% discount for Teachers on Classroom Supplies! Target: Extra 15% discount for Teachers on Classroom Supplies! For the first time ever, Target is offering teachers a 15% discount on classroom supplies! Target is offering teachers nationwide 15% off select classroom supplies, from pens, pencils, crayons and markers to classroom storage and organization, tissues, hand sanitizer and more. Starting July 15, simply visit target.com/teacherprep to share some quick details and grab your coupon code. This process will take less than 30 seconds to complete. The 15% off coupon code will be valid from July 15 through July 21 both in the store and online. Plus, you can stack this coupon code with manufacturer coupons, Cartwheel and your Target REDcard discount. Get your coupon here.